Alabama has the longest constitution in the country, but rather than tackling the monumental task of overhauling of the state’s governing document, legislators and voters have continued to tack amendments onto it for years. The current count, according to the Public Affairs Research Council of Alabama, is 895, and on Nov. 8 voters will be asked to consider 14 new additions to the growing document. This year’s batch of amendments covers several varied topics, from municipal laws regulating the growth of weeds to the processes the Legislature must use to impeach state officials. However, because of the ambiguous wording in some of the proposed amendments, many voters, and even a few elected officials, have had trouble understanding what exactly they’re being asked to decide. While some of the 2016 amendments only apply to smaller areas of the state, others will have statewide effects as well as lasting impact on the way cities and counties along the Gulf Coast operate for years to come. Of all the statewide amendments on the Nov. 8 ballot, the first may be one of the most straightforward. It would change the way the terms expire for members of the Auburn University Board of Trustees by staggering them so that “no more than three trustees’” terms would expire in a single year. However, a “yes” vote on Amendment 1 would also increase the number of board members from 14 to 16 — adding two more at-large seats to the board that would specifically enhance its diversity by better reflecting the “racial, gender and economic diversity of” Alabama. Generating some controversy is Statewide Amendment 2, which prevents any money generated for state parks from being taken away for other uses. As Gulf State Park brings in major tourism revenue for the state while drawing visitors to Pleasure Island and its local attractions, this is an important amendment. As the Alabama Policy Institute notes, state parks’ user fees generate at least 80 percent of their funding, but last year $1 million in user fees was transferred away from parks to the state general fund. Continued budget cuts have resulted in closings of some state parks, reductions in operating hours of others and fee increases. Another provision of the amendment would seem to support projects like the lodge and conference center at Gulf State Park, which involves a 20-year franchise agreement with Hilton Hotels. It would let private entities operate hotels, restaurants and golf courses on state park lands, instead of restricting those operations to the Department of Conservation and National Resources. Proponents such as Tim Gothard, executive director of the Alabama Wildlife Federation, argue that the amendment helps parks plan for repairs and maintenance without unexpected raids on budgets that have led to the closing of some parks and cutbacks on operating hours in others. 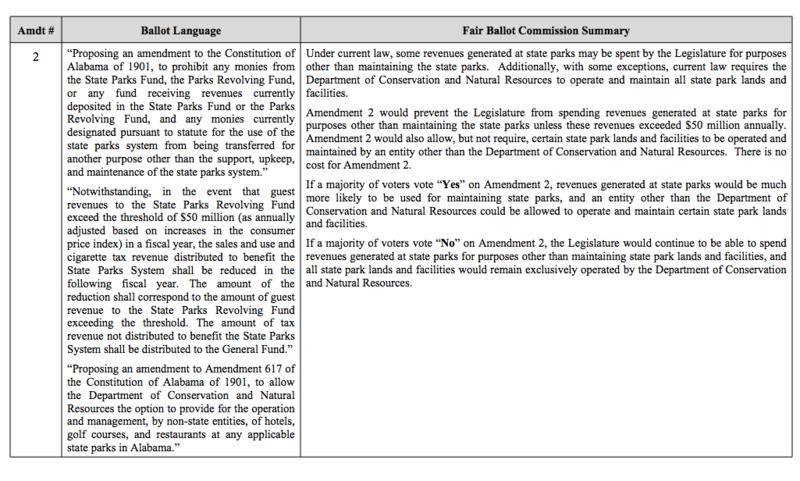 Opponents such as Glynn Wilson, writing in the New American Journal, argue the amendment is actually a back door to privatization of state parks, and that the Legislature could have banned raids on park revenue with a bill rather than a constitutional amendment. 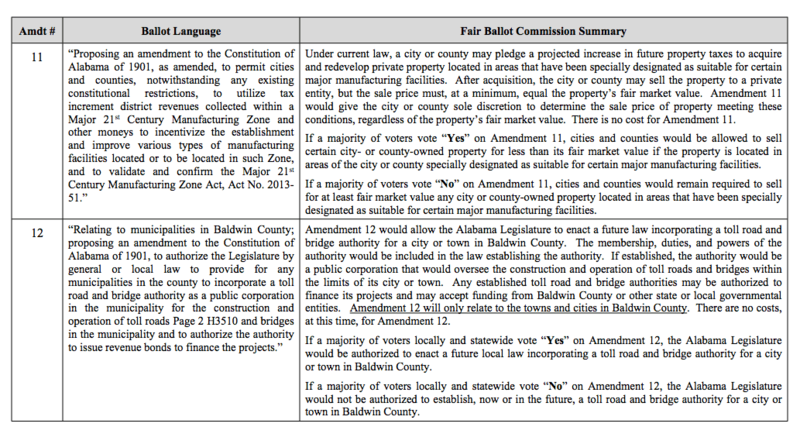 Voters may notice some of the ballot amendments don’t apply to Mobile or Baldwin counties. In the future, whom those local decisions are left up to will depend, in large part, on how the residents vote on Amendment 3. When the Legislature proposes a constitutional amendment it must go before the voters for a final approval. In some cases, a change may only affect a certain county or city, and if there’s no dissenting vote in the Legislature those issues can be placed exclusively on the ballots in those areas. In other words, Mobile County voters would decide Mobile County issues. Putting something before the entire state is often a tough sell, and Pittman said it’s not uncommon for people in unaffected areas of the state to vote “no” on issues that don’t pertain to them as many can be “skeptical” of any constitutional change. However, even if an amendment makes it through the legislative process, a Local Constitutional Amendment Commission makes the final decision on whether it will only appear before voters in the area it affects or go before the entire state. A majority “yes” vote on Amendment 3 would abolish the Local Constitutional Amendment Commission and leave the final decision on local amendments to the Legislature. If approved, each house of the Legislature would be required to pass a separate resolution deciding whether a proposed amendment would be voted on locally or around the state. If even a single legislator were to vote against a resolution, the proposed amendment would be placed on the statewide ballot. However, the change also requires that any objection to a local vote be based on “the local nature” of the amendment and not the “substance” of the change itself — something Pittman said should prevent lawmakers from letting politics affect areas they don’t actually represent. The original Alabama Constitution gave the Legislature a lot of authority over smaller political subdivisions. However, the Alabama Limited Self Governance Act of 2005 loosened some of those restrictions and gave counties the authority to adopt certain programs and policies without approval from Montgomery. That allowed counties to adopt laws that concern “controlling weeds, junk yards, litter and rubbish, noise, pollution, unsanitary sewage and animal control” without legislative approval, provided they were approved by a majority of voters in the affected areas. The fifth amendment on the ballot deals with eliminating redundancies in the state constitution outlining the separation of powers between the legislative, executive and judicial branches of government. Currently, language setting up that separation of powers can be now found in two parts of the constitution — in Amendment 582 and in Article III, sections 41-43. Amendment 5 would combine some of the redundant language in those sections of the constitution and remove some more antiquated language included when the constitution was first ratified in 1901. 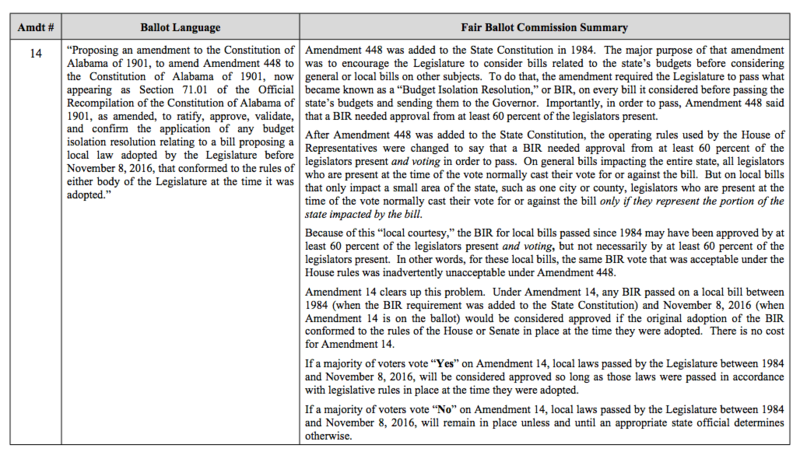 According to the Alabama Policy Institute, the changes proposed in Amendment 5 are stylistic, not substantive, and a “yes” vote would simply clean up a constitution that is already the longest in the country. 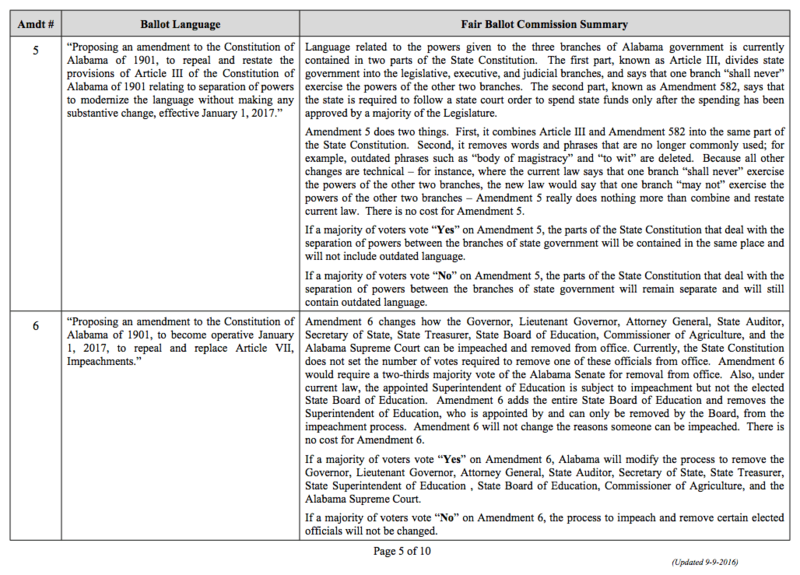 As written, Amendment 6 would require a vote from two-thirds of Alabama senators in order to impeach any of the state’s constitutional officers, including the governor, lieutenant governor, attorney general, state auditor, secretary of state, state treasurer, commissioner of agriculture and the justices on Alabama’s Supreme Court. If passed, Amendment 6 would also remove the state superintendent of education from the list of officials that can be impeached by the Legislature while adding the elected members of the state board of education for the first time. Opponents of the amendment — including State Auditor Jim Zeigler — say a “yes” on Amendment 6 could be a “Get Out of Impeachment Free Card” for Gov. Robert Bentley. Though opponents argue the current impeachment process requires a simple majority of “50 percent of the Senate plus one additional senator,” there is actually no language in the constitution setting the number of Senate votes needed to remove a public official from office. If approved, Amendment 6 would officially set that bar for the first time at two-thirds of the state Senate. If it fails, the current impeachment process will remain unchanged. 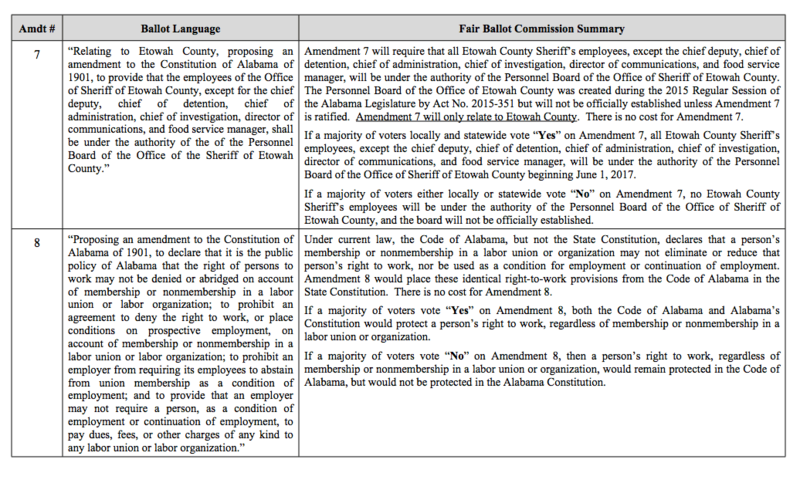 Applicable only to Etowah County, Amendment 7 would allow the Etowah County Sheriff’s Department’s to manage the majority of its personnel by removing them from the purview of the Etowah County Personnel Board. Amendment 8 deals with Alabama’s “right-to-work” law, which protects citizens from being fired or denied employment based on their membership or nonmembership in an organized labor union. 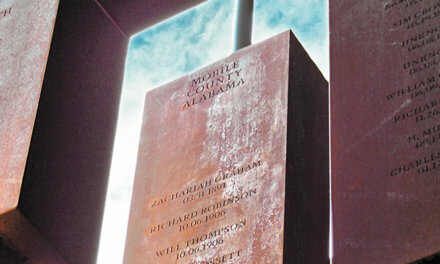 The law has been part of the Code of Alabama since 1953 but never included in the state constitution. Because the state code can be changed with a vote in the Legislature, proponents of Alabama’s right-to-work law say adding it to the Alabama Constitution would further protect workers because, once added, it could only be removed in the future by a statewide referendum. As written, a “yes” vote for Amendment 8 would do just that. Amendment 9 is specific to Pickens County, where a “yes” vote would abolish the state’s age limit of 70 for judicial officials. The change would only apply to circuit and district judges. 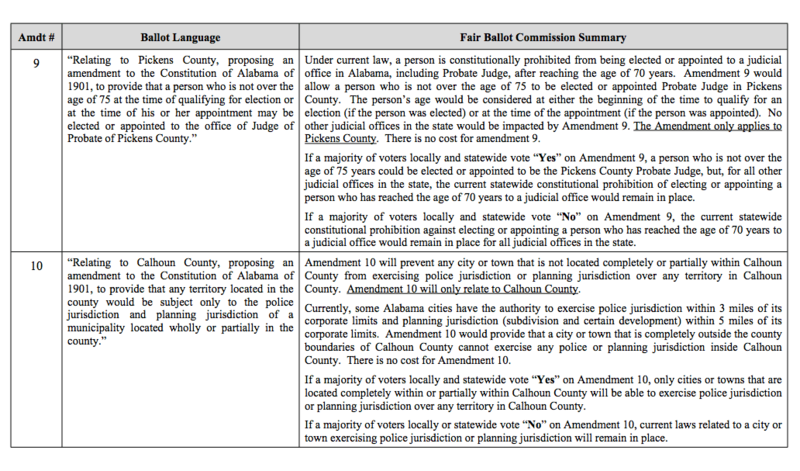 Another county-specific change, a “yes” vote on the 10th amendment would prevent any city or town outside of Calhoun County from exercising a police jurisdiction in a territory that falls within Calhoun County. 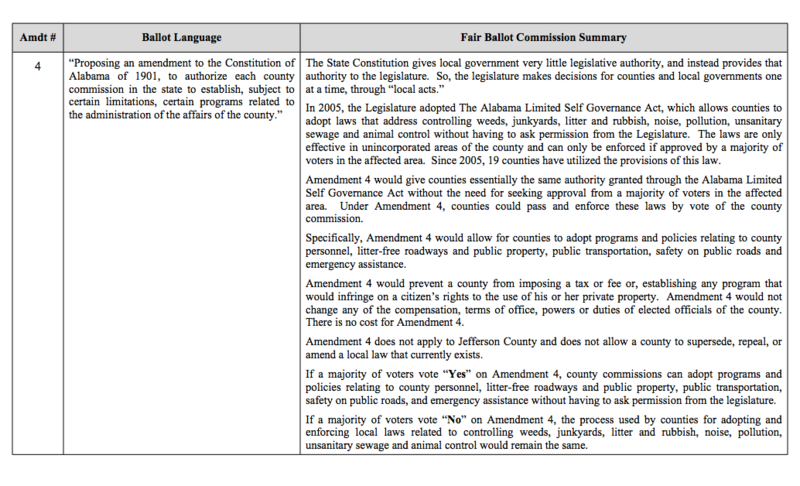 Regardless of the outcome, Amendment 10 will have no effect on the state budget or Alabama’s 66 other counties. Amendment 11 aims to loosen some of the existing restrictions on economic development by allowing cities and counties to sell certain properties to private entities for less than their fair market value. A Tax Increment Financing (TIF) zone can be established anywhere a private entity plans to invest at least $100 million in an area with more than 250 contiguous acres. Usually TIF zones are set up in areas that have been specially designated for redevelopment or for housing major manufacturing facilities. Establishing a TIF zone caps property taxes within the designated area for several years, and a municipality can then use revenues generated from increased property values to acquire or redevelop property within the TIF zone. That funding can also help pay for tax incentives used to attract additional development to the area. Under the state’s current law, though, municipalities can only sell property to private entities at or above the land’s fair market value. However, Amendment 11 would allow cities and counties to sell property within a designated manufacturing area or TIF zone for less than the fair market value, even if the sale is to a private entity. Mobile has made regular use of TIF zones and their proceeds, which helped fund the construction of the RSA Tower in 2003 and allowed the city to contribute $4.5 million to a private apartment development in downtown Mobile earlier this year. Although it is a statewide amendment, No. 12 affects only Baldwin County. It would let the Legislature authorize any municipality to create a toll road and bridge authority to build toll roads and bridges and to finance the projects with revenue bonds. Projects under discussion in Baldwin County include a new extension of the Beach Express from Interstate 10 to Interstate 65 as well as a new bridge off Pleasure Island into the south part of the county. The whole state gets to decide on this one. Under current law, people who have reached a certain age are not allowed to run for or be appointed to certain public offices. If passed, Amendment 13 would abolish that restriction while also preventing the Legislature from passing any future law imposing a maximum age restriction for any public official. The bill that initiated the referendum on Amendment 13 was sponsored by local Rep. Victor Gaston (R-Mobile), and its draft included state judicial officials among those who would no longer be subject to maximum age restrictions. However, changes in the Senate version of the bill added an exception for judicial officers, meaning that judges in Alabama will remain unable to seek re-election after reaching the age of 70 regardless of the vote on Amendment 13. Many state officials have suggested Amendment 14 might be the most important ballot measure voters are asked to decide on Nov. 8. The decision could affect more than 600 existing laws throughout the state that have already been adopted, including several local acts that affect Mobile and Baldwin counties. In 1984, the Alabama Legislature passed Amendment 448, which required state lawmakers to consider bills related to the state’s budgets before considering any other bills. However, according to Rep. Chris Pringle (R-Mobile), the provision “never did what it was intended to do” because lawmakers have routinely used a provision of that law to pass Budget Isolation Resolutions (BIR) in order to take up bills out of order. While Amendment 448 allows legislators to do this, BIRs also require approval from at least 60 percent of the legislators present in the chambers at the time they are considered. However, the House of Representatives has for years passed BIRs that were only approved by 60 percent of legislators voting on the particular issue. That has specifically caused problems with local bills because, typically, only the legislators representing the affected portion of the state vote on those issues — leaving hundreds of local laws subject to to possible legal challenges due to the procedure used to pass them. One law passed with a BIR was already invalidated in December 2015 after a Jefferson County judge ruled the Legislature had not properly enacted it. That created the need to legitimize hundreds of laws that have been passed in a similar manner since 1984. 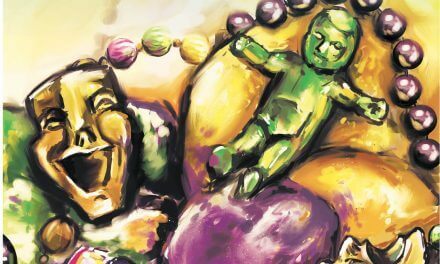 Those laws include more than 40 local acts affecting Mobile County and its cities — including the Zogby Act, which in 1985 established the form of government the city of Mobile still uses today. A “yes” vote on Amendment 14 would retroactively approve all BIRs passed between 1984 and Nov. 8, 2016 — provided those bills conformed to rules of the House or Senate that were in place at the time they were adopted. Mobile County voters will only have to tackle one local amendment, and it’s a familiar one — the county’s Pay As You Go construction program, which finances millions of dollars of local infrastructure improvements annually. To do this, the county uses property tax revenues set up by a special highway tax to purchase bonds and then immediately sell them back to generate revenue for a number of road and bridge projects. This year voters will be asked to authorize the Mobile County Commission to issue bonds up to a limit of $48 million — money that is then kept in a fixed-interest account paying a set rate of 12 percent. The PAYG program does not raise taxes and generates interest for the county from the accounts that hold the bond proceeds. A full list of the projects this year’s bond revenues will fund is available at mobilecounty.gov. This measure affects only Bay Minette. It would allow the mayor of Bay Minette to appoint up to two more members to the Municipal Planning Commission, who must live in the police jurisdiction. Rep. Steve McMillan (R-Gulf Shores) said the goal is to give residents of the police jurisdiction representation on the commission. Amendment 2 would allow Baldwin County mayors to participate in the state Employees’ Retirement System. McMillan said the intent is to give the same opportunity to all mayors with no special treatment. Currently, he said, some mayors have the option to participate and some do not. This amendment sounds a lot like statewide Amendment 12, except that the Legislature could authorize the Baldwin County Commission — rather than only municipalities — to create a toll road and bridge authority. It could come into play if the Beach Express extension does go forward, McMillan said. Since only Baldwin County voters have a say, this one could succeed even if the statewide version does not. For proponents of home rule and constitutional reform, this is another example of why the number of constitutional amendments could break 900 on Nov. 8. The issue is whether golf carts can be operated on public streets in municipalities in Baldwin County, and the locals can’t decide for themselves unless this passes. McMillan said the issue of golf carts on the streets has been discussed for years. Tickets have been issued to errant golf cart drivers, and the legislative delegation has tried several times to get this amendment on the statewide ballot. An attorney general’s opinion requested by Brewton in 2008 concluded that a golf cart did not meet the legal definition of a vehicle that could operate on a public road. The local movement started in Magnolia Springs when gas prices were at their highest and residents wanted to save money by puttering around in their golf carts, McMillan said. Support has also come from residents of the Craft Farms development in Gulf Shores and from Silverhill. “I don’t know of any opposition, frankly,” he said. If Baldwin voters approve, each municipality could decide whether to authorize golf carts on their streets. McMillan said they would remain illegal on county roads and state highways. Baldwin County judges who are appointed to vacant circuit or district judgeships would not face election almost immediately, as can happen now, McMillan said. Instead, they would face voters at the first election scheduled six months after taking office. For example, under current law a judge could be appointed to fill a vacancy in December, then have to run for election in a March primary.